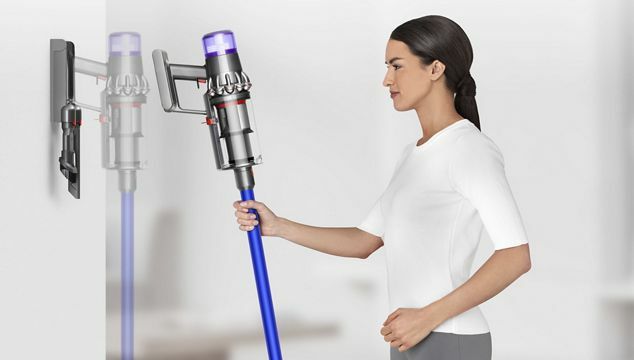 Twice the suction of any cord-free vacuum, at the cleaner head. Powered by the Dyson digital motor V11. 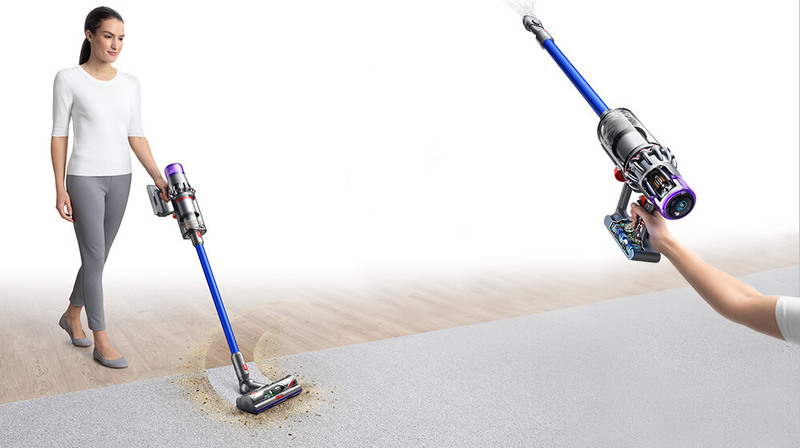 Twice the suction of any cord-free vacuum at the cleaner head. 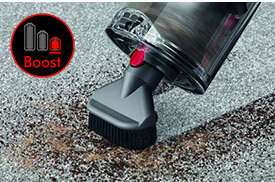 Designed for intensive cleaning on ground-in dirt. 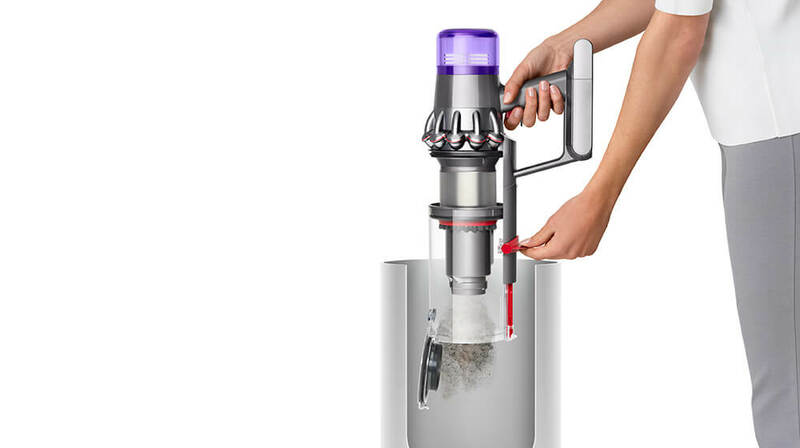 The Dyson V11 vacuum drops into the wall-mounted dock, to charge it and tidily store tools. So it's ready to grab and go. Dyson V11 Absolute Cordless Vacuum Cleaner is rated 4.8 out of 5 by 91. Rated 5 out of 5 by JMTG from Superb all floor vacuum cleaner Having had upright vacuum cleaners for over 20 years, I was sceptical about moving to a cordless version. This vacuum cleaner has more than allayed my fears! It very cleverly works out the type of floor and advises you of the battery life. The suction power comes in three options and it’s really easy to navigate between them. With 6 animals, we need a vacuum cleaner that can cope with constant use on different types of floors. This did not disappoint. I would recommend this model to anyone. It’s lightweight too which makes it perfect for anyone who might struggle with “lugging” a traditional vacuum cleaner from room to room. Rated 5 out of 5 by Sarah47 from Absolutely Brilliant! I can’t recommend the V11 enough. I have a V6, V8 and a Dyson Cinectic Cylinder. The V11 is in a different league. It’s as powerful as my Dyson Cinectic but with the ease of a handheld. The battery life can last for an hour but depends which of the 3 modes is chosen. 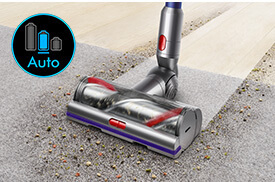 The vacuum head automatically adjusts to floor type and the battery run time is displayed on a digital screen. I have 2 dogs and I’m astounded at what the V11 pulled out of my thick piled rug! Overall i’d rate this vacuum 10/10. One more tweak that Dyson have added, is the ability to carry 2 tools that clip onto the stick. The V11 has replaced all 3 of my vacuums and I can’t recommend it enough. Rated 5 out of 5 by Anonymous from Great, it really can be your main vacuum I was very sceptical that a battery powered vac could be the main vacuum for the house. I was honestly shocked at how good it is, the suction is so good that I worked up a sweat actually pulling it back and forth across the carpets. The display showing how much battery is left is a great addition, no more panicking that the battery is about to die. The only issue would be the wall mount, I am used to the mount which comes with the V6 - this is slightly different, perhaps its user error, but it seems a bit harder to remove. All in all Im very happy with the V11, it is so versatile, I don't need an upright and a separate cordless one, this does the job of both. Rated 4 out of 5 by Tige from Easy to use,good features. I have had this machine for a week now. 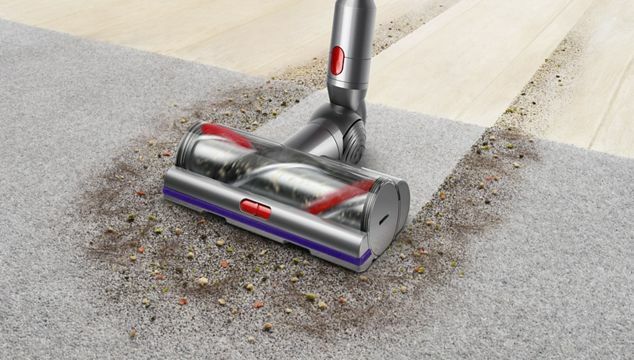 It has great suction power and I have seen real improvement to our carpets.I also have laminate flooring and have found it is also very good on this with the specific attachment. I have also found it is very good on the stairs and is easy to use with it being cordless. It also coped very well with a thick pile rug in my daughters room and has a good running time the attachments are all useful. If there is a downside to this machine it is that you have to keep your finger on the button to make it run other than that I have found it great and would recommend it to others. 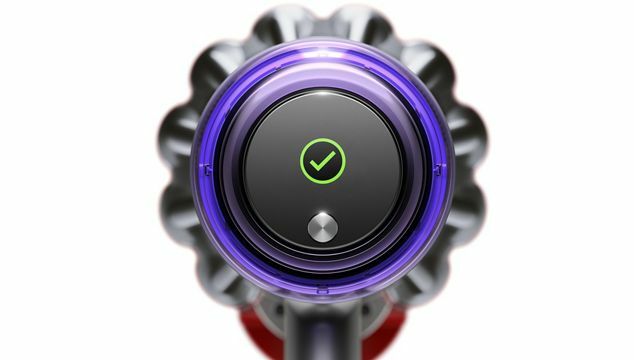 Rated 5 out of 5 by Hamad from Wow a big step up from my old dyson We really gave this dyson the full works on testing it. Amazing power and l loved the new display on the top that gives you the run time left on your dyson. The new tools are really good. I live in a house full of ladies. My mum , wife and two daughters they always got hair falling on the floor. Especially mum. Fantastic job off picking up and not clogging up the roller. I’ve always bought dyson and they proved me right. Best cordless vacuum on the market. It’s more easier to empty than my old one. The tools are a lot better although I can not fit them all on the wall fitting. Love the duster tool works really well.my two daughters have like it better as well as I get them to do some hoovering as well. Rated 5 out of 5 by jjwells84 from Beautiful machine We were incredibly lucky to receive the V11 as part of a product testing exercise. We have used it for a little while now and are both wowed by the new model. We have the V8 already and can definitely see improvements in both suction power and battery life. I love the self charge feature that replinishes the battery a small amount when you take your finger from the trigger- that noise is wicked too! The digital display is fantastic and is great to have and extra power setting from our previous model. I would definitely recommend this vacuum to anyone. Thank you very much Dyson!